Email marketing falls under the online marketing umbrella, more specifically, the content marketing umbrella. It’s how you establish and build a relationship with people who find your information and/or free gift of value and opt in to your mailing list. In other words, with your subscribers. This marketing strategy is absolutely essential to your business, so it’s important to know how to ‘kick it off right’ and how to make it powerful. 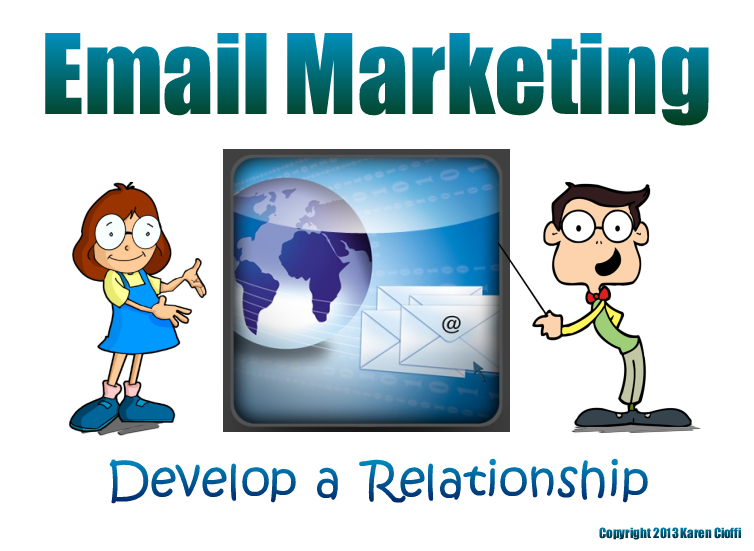 The process of creating powerful email messages is in an autoresponder series. The series will help establish the connection you’re striving for, establish you as an expert, and help sell what you’re offering. 1. Signing up with an email service provider. 3. Writing your Welcome Message (this will be the first message in your series). After these steps are in place, Colin Martin, pro copywriter and marketer, suggests you craft a series of nine (minimum) additional powerful messages that should be automatically sent every three to five days for the first month or so. Message One - make him glad he signed up. According to Martin, give your subscriber a reason to keep opening your emails. Message Two – address one problem and give the solution. Describe one primary problem or obstacle your subscriber faces. Freely give the solution to that problem. Ask if your solution is helpful. Next, link to a product or service you offer that will further help your subscriber with that problem or another problem. Make the link an anchor text. This message should go out 7 days after the subscriber signed up. The following messages should be scheduled three to four days after each other. Message Three – tell a story. For this email you can tell the story of a client or customer you helped, or you can write a story of someone who is unsuccessful. Or, tell your own story of failure to success. Explain how your service or product could make a difference. Provide an anchor text link to a sales page. Message Four – the special offer. Talk about what the subscriber needs. This might be based on your opt-in bribe. Make a special offer of one or more of your products or services. Let her know it’s only for subscribers and provide an anchor text link. Message Five – do a little bragging. Provide testimonials about your business. Or, ‘strut your stuff’ by linking to interviews of you, news items about you, recommendations, a webinar you presented, or other. Message Six – do a survey. This is a great way to get your subscribers involved and to find out what they really want and need. With this information you can create products/services to offer them. Message Seven – back it up. You’ve given a lot of free and valuable information, but you want your subscriber to know that the ‘industry’ backs up what you’re telling him. In this message, provide quotes (with reference links) and/or links to relevant news items and/or information by well-known experts in the field that will validate your information. In all probability, after several months or so, you’re subscriber will stop opening your emails. This is the general outcome of email marketing. You want to make sure you stay connected and still have opportunity to sell to that subscriber, so it’s important to connect with him on your social networks before this happens. Message Nine – give more solutions. Here you want to again identify and address a problem your subscriber has. Be the answer to the question, the solution to the problem. This will reinforce your ‘go-to person’ status. The welcome message and these successive nine email messages will cement your relationship with your subscriber. And at this point, these messages should have motivated him to buy what you’re offering. After the initial 10 automatic messages, you should provide helpful information regularly and occasionally reintroduce the first nine messages randomly here and there.